I don't know if you remember, but last week I was suppose to serve fish kebabs with my lemon and pea risotto, however I kinda forgot to buy the polenta! This week I was on top of the shopping and decided to pair the kebabs with chips. Usually I would never have served these two together, seeing as they are both long, and, well long. It doesn't seem right to serve kebobs with chips, but, I got over my hangup and began cooking the polenta so I could get on with it. Polenta doesn't really take that long to cool so I was able to start from scratch, BUT, if I was a more organised person (when I wrote this recipe I was hoping I'd become this way), I would of made the polenta base the day before and had it ready, then all I should of done was cut and shallow fry. Alas, that didn't happen and yet I managed to get all the preparation ready for when Nic came home and pulled it all together. It was late in the evening, kids were tired, hungry and I had lots of paper work to catch up on, so Nic came to the rescue. Once the polenta chips were cut, he threaded the fish on sticks, sprinkled with thyme and then whipped up a tomato and basil salsa drizzled in balsamic oil. I always think if you are making dinner and you know one part takes a little time (chips) then do yourself a favour and make the rest really easy. 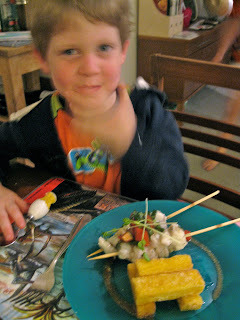 So, as the last batch of polenta chips hit the oil, Nic cooked the kebabs while Alex set the table. Such a simple yet novel idea threading fish onto a stick! The thyme really gave the fish (he used ling) a beautiful aroma, especially when char grilled and then biting into hot, crunchy, yet soft polenta was so, so good- especially if you managed to fit a dob of salsa on your fork. Ahh CHIPS... Being the dopy American I couldn't wrap my mind around what you were saying until I saw the picture! of course I was thinking crisps. 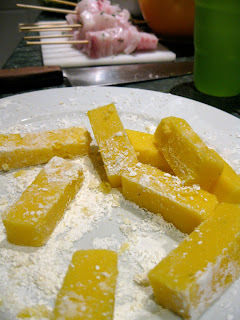 Looks great, I grill polenta all the time (love it) Fried seem even better and maybe the kiddos will try. Oops, sorry I forgot about crisps! Fish & chips, pizza and a detox anyone?